Knocked Out Adult Teeth; What to do? If you have found this article in a hurry, do not panic. Take a deep breath. This advice is if a tooth has been knocked out whole; the root and all. This does not apply if it a milk tooth has been knocked out. Milk teeth should not be put back in. Children will usually start to get their adult front teeth from 6 years old. The following advice applies to children and adults who have completely knocked out an adult tooth. 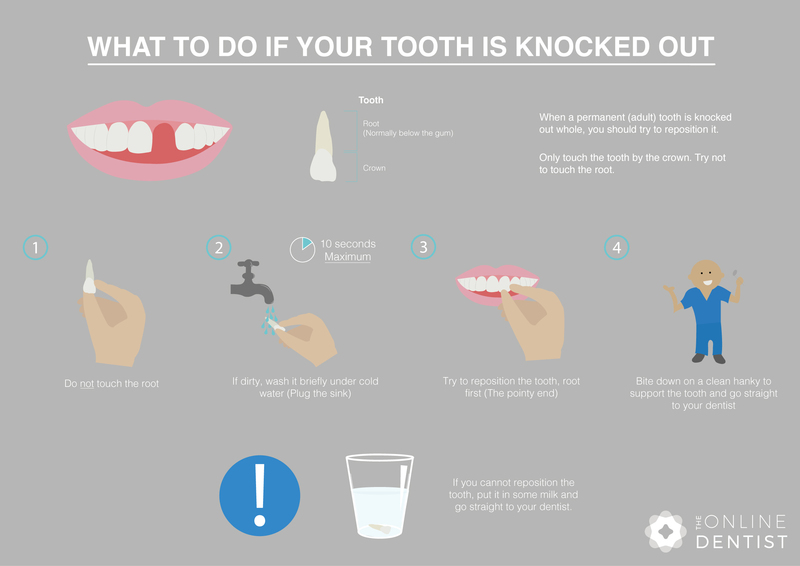 If you or your child have had a tooth knocked out and it looks like it is whole with its root, you need to act fast. The quicker it is put in, the better chance it has of lasting. 1. Do not touch the root. 2. Pick up the tooth by the crown. This is the bit that shows in your mouth normally. 3. If the tooth is dirty, wash it briefly under cold running water. Maximum 10 seconds. 4. Try to reposition the tooth in its socket, root first. This is the pointy end. 5. Bite on a clean hanky or cloth to hold it in place. 6. Get to your dentist. If it is not possible to reposition the tooth, put it in some milk and get to your dentist. You can keep the tooth in your mouth between your cheek and back teeth. The problem with doing this is that it is possible to swallow the tooth and then you’ve got no chance. If it’s a small child that has had their tooth knocked out, it’s probably not a good idea to get them to hold it in their mouth. Putting the tooth in milk is a safer bet. If it is possible to reposition the tooth yourself, do it. There is a much better chance of the tooth surviving if it is put back in as quickly as possible. Follow the instructions above. A tooth that has been knocked out and put back in is again almost always going to need root canal treatment. After an accident like this, just get to your dentist as soon as you can. Our advice is based on the evidence base of the Dental Trauma Guide.